a, Dopaminergic neurons in the midbrain project to all brain areas, most prominently to the striatum (black arrows). These cells fire at a constant rate of 3–5 spikes per second, with occasional phasic bursts or pauses on the occurrence of positive reward prediction errors (discovering that the local supermarket now supplies your favourite coffee beans, b) or negative reward prediction errors (sipping your coffee and finding that the milk has gone sour, c), respectively. The background (tonic) level of dopamine fluctuates slowly, possibly tracking the average rate of rewards (not shown). 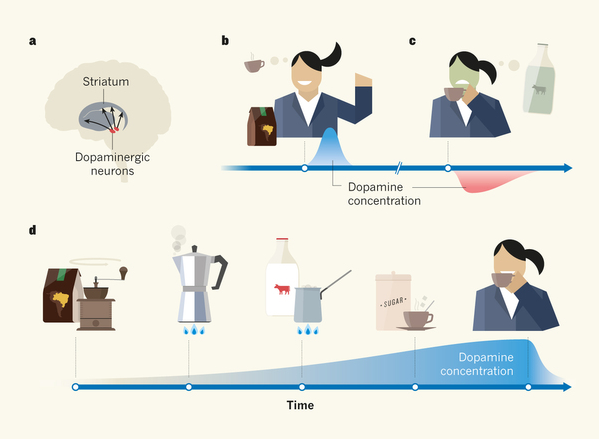 d, By measuring dopamine concentrations in the striatum of rats navigating mazes, Howe et al.1 reveal a third mode of dopaminergic signalling: when a prolonged series of actions must be completed to obtain a reward (for instance, all the steps it takes to make a cup of coffee), dopamine concentration ramps up gradually, at each point in time signalling the predicted distance from the goal. Predictions about future rewarding events have a powerful influence on behaviour. The phasic spike activity of dopamine-containing neurons, and corresponding dopamine transients in the striatum, are thought to underlie these predictions, encoding positive and negative reward prediction errors. However, many behaviours are directed towards distant goals, for which transient signals may fail to provide sustained drive. Here we report an extended mode of reward-predictive dopamine signalling in the striatum that emerged as rats moved towards distant goals. These dopamine signals, which were detected with fast-scan cyclic voltammetry (FSCV), gradually increased or—in rare instances—decreased as the animals navigated mazes to reach remote rewards, rather than having phasic or steady tonic profiles. These dopamine increases (ramps) scaled flexibly with both the distance and size of the rewards. During learning, these dopamine signals showed spatial preferences for goals in different locations and readily changed in magnitude to reflect changing values of the distant rewards. Such prolonged dopamine signalling could provide sustained motivational drive, a control mechanism that may be important for normal behaviour and that can be impaired in a range of neurologic and neuropsychiatric disorders.